Two title contenders are down a projected starter. And yet neither should feel like they have less of a chance to win the national championship than Duke, Tennessee, Virginia, Kentucky, Michigan or anyone else. Michigan State, number 8 in the NCAA men’s basketball tournament selection committee top 16 reveal last Saturday and No. 12 in the latest Power 36, won’t have Joshua Langford for the rest of the season after sustaining a foot injury. He averaged 15 points and 3.6 rebounds a game. The Spartans were 11-2 with him, 8-3 now without him through Monday’s games. Gonzaga, which was No. 4 in the top 16 and No. 3 in the Power 36, won’t have Killian Tillie for the rest of the regular season. The Zags aren’t ruling out Tillie returning for the postseason with a torn ligament in his foot. Tillie missed the first 15 games with a stress fracture in his foot. 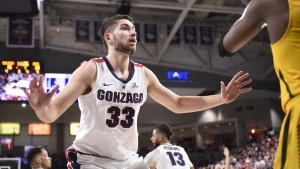 The Zags were 13-2 without Tillie the first time, 9-0 with him (6 ppg, 4.2 rpg) and then 1-0 without him again as the Zags destroyed rival Saint Mary’s by 48. Here are what the injuries could mean for both team’s future this season. What did Langford mean to the Spartans when he played? He was the veteran leader and the co-captain who was the anchor at both ends of the floor. He was one of the top defenders for Michigan State. He was demanding of himself and was a winner. What did Tillie mean to the Zags when he was playing? Tillie brought skill, savvy, toughness and experience. He was only a month into playing when he got hurt again and was making progress. There was an expectation that he was going to have a breakout game, but he hadn’t yet gotten to his sophomore season form. What have the Spartans been able to do without Langford on the floor? Langford has helped prep Kyle Ahrens (who has been battling injuries himself this season), Aaron Henry and Gabe Brown since they have been the players stepping into his absence. And they have responded in key moments to fill the void. How have the Bulldogs played without Tillie? Gonzaga was in a pinch when Tillie and backup guard Geno Crandall were both out because the rotation was off, even though they play different positions. The December road games against Tennessee in Phoenix and then at North Carolina, the only two losses, wore on the team’s depth. But Crandall’s return has given the lineups even more pop. The Zags have plenty of rotations with Rui Hachimura and Brandon Clarke making up one of the top frontcourt tandems in the country. The Zags had to play Jeremy Jones more at power forward without Crandall but now he can play a more natural small forward (the backcourt needed help) with the depth returning to the wings. Now the Zags can play Corey Kispert at power forward. How can Michigan State win the title without Langford? The Spartans must focus on what they do best — defend, rebounds and run. Do that and they can win the title. Let’s not forget they’ve got one of the best point guards/leaders in Cassius Winston, an anchor inside in Nick Ward, a superior wing in Xavier Tillman and plethora of rotation guys like Matt McQuaid who can and have made big shots. How does Gonzaga win the title without Tillie if he can’t come back for the postseason? The onus will be on Hachimura and Clarke to handle more minutes but it’s not out of the question for them to go 30-plus. Still, having the option of using Filip Petrusev more could be a difference maker. He hit a bit of a freshman wall in December but his practice habits have improved mightily and while the minutes that may have gone to him were going to Tillie, now they can be shifted back. The combination of Josh Perkins and Zach Norvell Jr. in the backcourt and the rotation of Hachimura, Clarke, Kispert and Petrusev up front with backups Crandall and Jones gives Gonzaga as much of a chance any other contender.